Attention racers and non racers alike, In addition to the slalom series to be held at the St. Francis Yacht Club on Friday nights (May 29, June 26, July 24 & August 21) this season, we are also organizing a second slalom series on Saturdays to be held at Crissy Field, the day after the Friday night races. We need your support to ensure slalom racing will happen this season in San Francisco. 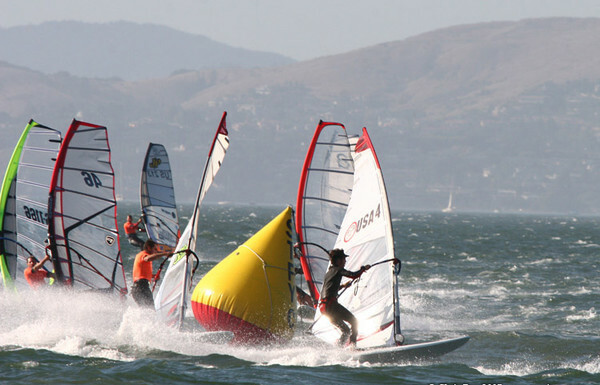 4 race dates are planned for the 2015 Crissy Field Slalom Series on Saturday afternoons – May 30, June 27, July 25 & August 22. A 4-5 mark downwind slalom course will be set with a start at Anita Rock and a finish off the St.FYC race deck with an A fleet start for experienced racers and a B fleet start for less experienced racers. If you’ve never raced, this is your chance. Its a fun easy to get around course that takes less than 2-3 minutes to complete. Several races will be run for each fleet and awards will be held afterwards at the picnic tables at Crissy near the windsock. By donating to the crowdfunding site (https://fundrazr.com/campaigns/8yK3b/ab/d4gTQ1) up to 1 week before the 1st event, you can ensure the series will happen + get a reduced entry fee. A $100 donation (before May 23) will serve as your pre-registration for the series (vs $120 if you pay for the series after May 23.) Individual drop in races are $30 each night. A $250 donation allows you to become a sponsor of the event with your name and company’s logo on the series marketing material, press releases and official web page + a spot on the starting line! The 1st 2 events are scheduled for May 30 and June 27 but we need to crowdfund the remaining funds to ensure the last 2 events on July 25 & August 22 will happen. We consider your donation to be an essential part of making the series happen. Even if you’re not racing, we would love your support in making this happen. In addition to the funding we will also need several volunteers to help with scoring and act as a beach master. Without it, the organizers (Steve B, Jean R and Soheil Z) are left holding the weight of the event on their shoulders. Thank you for your support and see you on the water. PS: Despite the rumors of kite foiling fever- the reports of my windsurfing death have been greatly exaggerated.